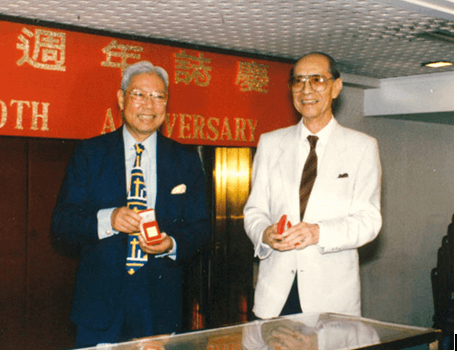 David Miao (right) and George Ho at the 30th anniversary party for Commercial Radio in 1989. As the leading radio station in town, Commercial Radio has been a high-profile institution since its founding in 1959. 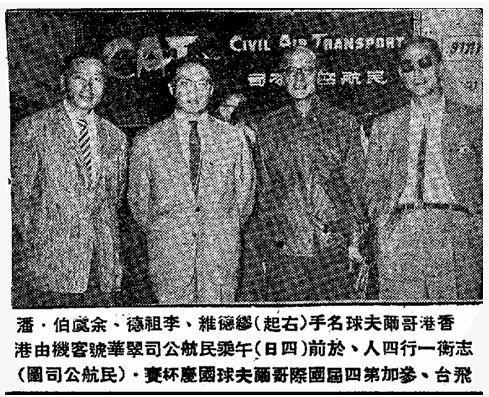 While the public is familiar with its founder and longtime chairman George Ho (何佐芝,1918-2014) and the firm’s directors and shareholders included many luminaries such as the philanthropist Sir Tang Shiu-kin, the newspaper publisher Shum Wai-yau OBE (founder of Wah Kiu Yat Po), the legislator Lo Man-wai CBE (Ho’s relative and as Legco/Exco councilor helped the group secure its license), the banker Oen Yin-choy (founder of Union Bank) and even the Hollywood actor William Holden and their families, little is known about one of its longtime directors and major shareholders David Miao, who was Ho’s business partner in the highly successful trading firm of Goddard & Co Ltd (佐德股份有限公司) which represented many high profile products in the HK market. The Chinese name of Goddard is the combination of the second character of George’s Chinese name and the second character of David’s Chinese name and the firm was primarily managed by David while George focused his energy on Commercial Radio. The first area the partners at Goddard chose to focus on was the nascent field of radios. 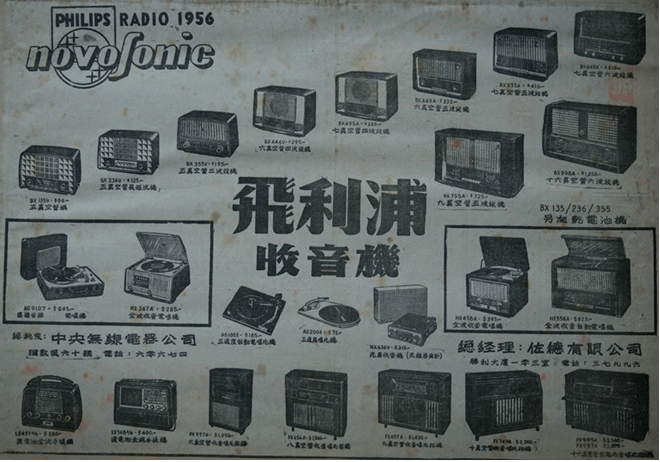 In 1948/49, Radio Hong Kong (successor of ZBW and precursor of RTHK) and Rediffusion were formed and ushered in a new era of radio broadcasting in HK. Sensing emerging opportunities, Goddard secured the sole distributorship of radios made by the Dutch electronics giant Philips, which had been making radios since the 1920s and had recently established its branch office in HK in 1948. To facilitate the sales of radios, Goddard partnered up with Central Radio & Electric (), a firm in Kowloon founded in 1926 and managed by J.T. Cotton. With the help of Goddard and Central, Philips radios captured 70-80% of the market share in HK within a short period of time but the problem was that the market remained very small (Rediffusion for example only had 50,000 subscribers, a small subset of the entire HK population) due to the lack of quality radio programming. Taking a page from Philips who started its own radio stations back in the Netherlands in the 1920s to promote its radios, George Ho started broadcasting programs of Macau’s Radio Vilaverde in HK in 1954. In 1957, he successfully secured the third radio broadcasting license and Commercial Radio commenced operations in 1959 in Lai Chi-kok in premise rented from Standard Vacuum Oil. The popularity of Commercial Radio and others led to strong sales of Philips radio for Goddard but eventually Philips’ market share dropped thanks to competition from Japanese and local radio manufacturers and the radio station business became more important than the distribution of radios for the partners. David Miao remained a non-executive director of Commercial Radio (HK Commercial Broadcasting Co Ltd) and its affiliate HKCBC Enterprise and ABC Communications (launched paging service in 1971, listed in 1991 and cofounded Smartone in 1992) from inception until his death. From radio, Goddard expanded into the field of installing audio systems in 1958 and was responsible for installing the audio systems of many major hotels such as the Mandarin, the Hilton and Hotel Lisboa in Macao (operated by George’s cousin Stanley Ho), hospitals, schools, police stations and even funeral homes. The firm was also involved in CCTV monitoring systems for casinos and banks. In 1970, Goddard was also appointed sole distributor of Japanese electronics giant NEC in HK. Aside from TV, radio and tape recorders, the NEC distributorship also included high end equipment for television broadcasting, radar systems and telecom equipment. Eventually both Philips and NEC took back the distribution of its audio products in HK. Today, HK is the global headquarters for Philips’ Audio business unit and this connection can be traced back to its partnership with Goddard in the 1950s. From radios, Goddard moved on to other electronic goods such as cameras, copiers and air conditioners. In 1960, Goddard became the exclusive distributor of cameras and copiers of the Japanese firm Minolta in Hong Kong. Founded in 1928 by Kazuo Tashima (田鸠一雄, 1899-1985), Minolta cameras had been available in HK since 1953 and in 1960 it launched its first copier – the Copymaster. With its innovative products, high quality and reasonable price, Minolta products were very popular in HK and the region. In fact, it was so popular that grey markets emerged with sailors smuggling Minolta camera from Japan into HK and the ones in HK being re-distributed into rest of Asia. As a result, Minolta founder Kazuo Tashima initiated discussions with George Ho (who had become a friend) to formulate a solution. In 1971, Goddard and Minolta formed Minolta Hong Kong Limited as a joint venture to market Minolta products in the Asia ex Japan region with Hirosada Suzumura as managing director. David Miao remained a non-executive director of Minolta HK Ltd until the early 2000s. Minolta merged with Konica to form Konica Minolta in 2003 and in 2006, Minolta exited the camera business to focus on copiers and other imaging equipment. In 1961, Goddard Engineering was formed to distribute and service air conditioners. The manager of Goddard Engineering was C.P. Louie, an engineering graduate of Hangchow University. The two brands of air conditioners supported by Goddard Engineering were Hitachi from Japan and Chrysler Airtemp from the US (launched in 1930 to provide air conditioning for the Chrysler Building in New York). 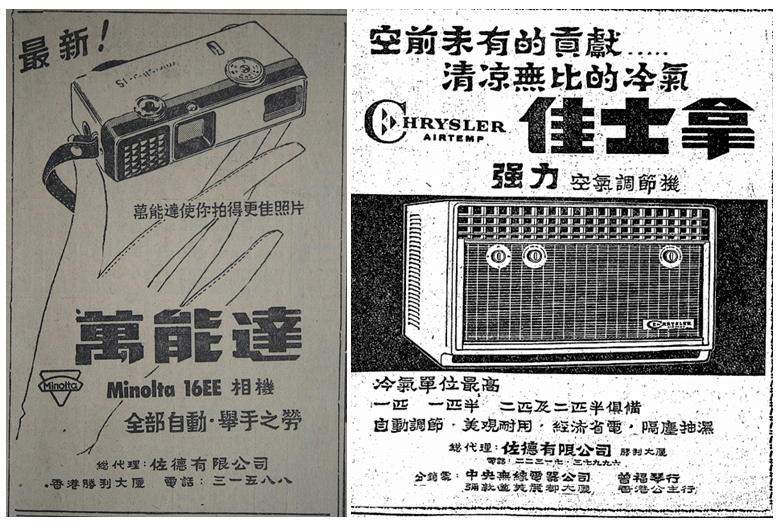 Airtemp was absorbed by Fedders in 1976 and faded into history while Hitachi air conditioners continued to be distributed in HK by Hitachi’s HK branch. Aside from electrical appliances, Goddard was involved in distribution of food and beverage. The most famous of this was Four Cows branded condensed and evaporated milk (四牛煉奶), which was a product of Domo-Bedum, the large Dutch dairy cooperative and was popular with parents of infants. The firm was also the distributor of a number of liquor such as Ballantine’s(百齡壇威士忌), Camus (金花白蘭地) and Ambassador Scotch Whiskey. In terms of food, Goddard distributed Red Boy Toffee produced by A.S. Wilkin of the UK. In 1985, George Ho who was dissatisfied with the quality of peanuts in HK launched Cowboy Food to produce peanuts – the Cowboy brand of peanuts (牛仔牌花生) was very popular in the 1990s and was available in 80% of hotels and bars and also on flights of Cathay Pacific. The peanut business was acquired by the listed Four Seas Mercantile Holdings. Outside of Goddard, David Miao ran South China Medical Supplies (Somedico) which was the sole agent for Schering (which became Schering-Plough in 1971 and merged with Merck in 2009) in HK. The distributorship of Schering expanded to Singapore and Malaysia in the 1950s and 1960s. The Malaysian subsidiary was later renamed Somedico in 1969 (the firm is now controlled by the Howe family which also owns stake in Commercial Radio in HK) while the HK business of Somedico was sold to Hutchison. 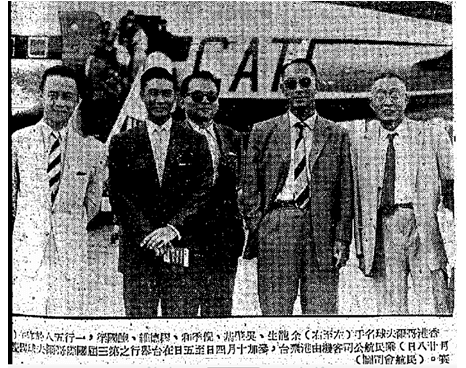 In 1955, Miao formed Sine Laboratories (HK 1955) Ltd as a continuation of Sine Labs (HK) Ltd with Chan Wing-hun and Hugh Bao, a golfing partner of Miao and famous pharmaceutical executive from Shanghai who co-founded the original Sine Labs with his brother. (to be covered in a separate article) Sine Labs (HK 1955) Ltd dissolved in 1987. Outside of work, David Miao was an active golfer. 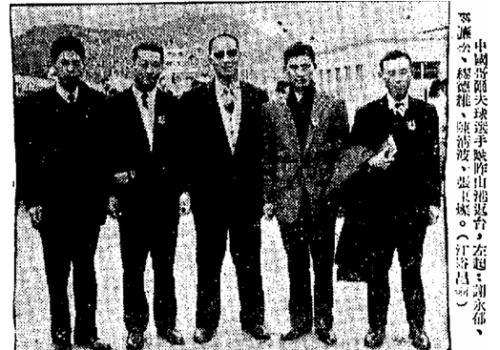 He served as president of Duffers, a Chinese golf fraternity founded in 1954 by fellow Shanghainese golfers and represented Hong Kong and Taiwan in a number of international golf tournaments in the late 1950s as shown by the pictures above. After his death in 2006, his board seat at Commercial Radio was succeeded by Amy Miao (繆美恩). This article was first posted on 1st January 2018. Q+A 40 Sakura Radios, manufactured in Hong Kong?